For other uses, see Oatmeal (disambiguation). Oatmeal is a type of coarse flour made of hulled oat grains – groats – that have either been milled (ground), steel-cut, or rolled. Ground oats are also called "white oats". Steel-cut oats are known as "coarse oatmeal" or "Irish oatmeal" or "pinhead oats". Rolled oats can be either thick or thin, and may be "old-fashioned", or "quick", or "instant". The term "oatmeal" is also used in the U.S. and parts of Canada as another word for an oat-based porridge popular in such countries made from either ground, steel-cut, or rolled oats. The oat grains are dehusked by impact, then heated and cooled to stabilize the oat groats – the seed inside the husk. The process of heating produces a nutty flavour in the oats. These oat groats may be milled to produce fine, medium or coarse oatmeal. Steel-cut oats may be small and contain broken groats from the dehusking process (these bits may be steamed and flattened to produce smaller rolled oats). Rolled oats are steamed and flattened whole oat groats. Old-fashioned oats can be thick and take a while to boil to make porridge. Quick-cooking rolled oats (quick oats) are cut into small pieces before being steamed and rolled. Instant oatmeal is precooked and dried, often with a sweetener, such as sugar, and flavourings added. Both types of rolled oats may be eaten uncooked, as in muesli, or may be cooked with water or milk to make porridge. In some countries, rolled oats are eaten raw or toasted with milk and sugar, sometimes with raisins added, like a basic muesli. The term "oatmeal" sometimes refers to a porridge made from the bran or fibrous husk as well as the oat kernel or groat. Rolled oats are often used as a key ingredient in granola breakfast cereals (in which toasted oats are blended with sugar and/or nuts and raisins) and granola bars. Rolled oats are also used as an ingredient in oatmeal cookies, oatcakes, British flapjack bars and baked oatmeal dessert dishes such as Apple Brown Betty and apple crisp. Oats may also be added to foods as an accent, as in the topping on many oat bran breads and as the coating on Caboc cheese. Oatmeal is also used as a thickening agent in thick, savoury Arabic or Egyptian meat-and-vegetable soups, and sometimes as a way of adding relatively low-cost fibre and nutritional content to meatloaf. Unenriched oatmeal, cooked by boiling or microwave, is 84% water, and contains 12% carbohydrates, including 2% dietary fiber, and 2% each of protein and fat (table). In a 100 gram amount, cooked oatmeal provides 71 Calories and contains 29% of the Daily Value (DV) for manganese and moderate content of phosphorus and zinc (11% DV each), with no other micronutrients in significant content (see table on right). Oatmeal and other oat products were the subject of a 1997 ruling by the Food and Drug Administration that consuming oat bran or whole rolled oats can lower the risk of heart disease when combined with a low-fat diet via the effect of oat beta-glucan to reduce levels of blood cholesterol. A similar conclusion was reached in 2010 by the European Food Safety Authority. In the United States oatmeal is often served as a porridge with milk or cream and a sweetener, such as brown sugar or honey. It may include additional ingredients such as peanut butter, cinnamon, or various types of fruits. Oatmeal has a long history in Scottish culinary tradition because oats are better suited than wheat to the country's low temperatures and high humidity. As a result, oats became the staple grain of Scotland. The ancient universities of Scotland had a holiday called Meal Monday to permit students to return to their farms and collect more oats for food. Samuel Johnson referred, disparagingly, to this in his dictionary definition for oats: "A grain, which in England is generally given to horses, but in Scotland supports the people." His biographer, James Boswell, noted that Lord Elibank was said by Sir Walter Scott to have retorted, "Yes, and where else will you see such horses and such men?" A common method of cooking oatmeal in Scotland is to soak it overnight in salted water and cook on a low heat in the morning for a few minutes until the mixture thickens. Staffordshire oatcakes are a local component of the full English breakfast. It is a plate-sized pancake, made with equal parts medium oatmeal and wheatmeal (flour), along with frothing yeast. Once the mixture has risen to produce something like a Yorkshire pudding batter, it is ladled onto a griddle or bakestone, and dried through. Staffordshire oatcakes are commonly paired with bacon, sausages, mushrooms, kidney, and baked beans, among others. A related oatcake is sometimes found in neighbouring Derbyshire. Throughout the Nordic and Baltic regions, oatmeal porridge made from rolled oats and water or milk is a traditional breakfast staple. Known under various local names meaning "oat porridge", "oat flake porridge" or "oatmeal porridge", it is normally made either salty or sweet by adding salt or sugar, and it is often eaten with added raisins or other dried fruits. Local names for the porridge include Swedish havregrynsgröt, Danish havregrød, Norwegian havregrøt or havregrøt, Icelandic hafragrautur, Finnish kaurapuuro, Estonian kaerahelbepuder, Latvian auzu pārslu (putra), Lithuanian avižinių dribsnių košė and Polish owsianka. Oatmeal porridge has a long tradition in these regions, but during the Middle Ages porridge made from rye or barley was even more common in at least some parts of the area. ^ "How Oats are Processed". buzzle.com. ^ "Nairn's (2010)". Nairns-oatcakes.com. Retrieved 2012-10-08. ^ Hosahalli Ramaswamy; Amalendu Chakraverty; Mujumdar, Arun S.; Vijaya Raghavan (2003). Handbook of postharvest technology: cereals, fruits, vegetables, tea, and spices. New York, N.Y: Marcel Dekker. pp. 358–372. ISBN 978-0-8247-0514-5. Retrieved Feb 13, 2010. ^ "21 CFR Part 101; Docket No. 95P–0197; RIN 0910–AA19; Food Labeling: Health Claims; Oats and Coronary Heart Disease" (PDF). US Food and Drug Administration. 23 January 1997. Retrieved 29 July 2017. ^ EFSA Panel on Dietetic Products, Nutrition and Allergies (2010). "Scientific Opinion on the substantiation of a health claim related to oat beta glucan and lowering blood cholesterol and reduced risk of (coronary) heart disease pursuant to Article 14 of Regulation (EC) No 1924/2006". EFSA Journal. 8 (12): 1885. doi:10.2903/j.efsa.2010.1885. ^ Journal of the Royal Agricultural Society of England. Royal Agricultural Society of England. 1859. p. 169. ^ The Life of Samuel Johnson, LL.D. : Including a Journal of His Tour to the Hebrides. Volume 3 by James Boswell. New York: Derby & Jackson, 1858. Page 11. ^ The Food Journal. London: J.M. Johnson & Sons. 1874. Retrieved Feb 14, 2010. The grain of oats, intended for human food, is generally prepared by being ground into meal; although it is also used in the form of groats, that is, of grain denuded of its husk, and merely broken into fragments. Oatmeal is of two kinds, both common in all shops in which it is sold, fine meal, and coarse or round meal. For various purposes, some prefer the one and some the other. There is no difference in quality, but merely in the degree in which the grain has been triturated in the mill. ^ a b Sybil Kapoor (2010-01-07). "How to make perfect porridge | Life and style". London: The Guardian. Retrieved 2012-10-08. ^ "Oatmeal product list of a Scots manufacturer". Hamlynsoats.co.uk. Retrieved 2018-08-14. ^ Mairi Robinson, ed. (1987). The Concise Scots Dictionary. Aberdeen University Press. p. 648. ISBN 978-0-08-028492-7. ^ Cloake, Felicity (2018-01-29). "How to make the perfect staffordshire oatcakes | Food". The Guardian. Retrieved 2018-08-14. Look up oatmeal in Wiktionary, the free dictionary. 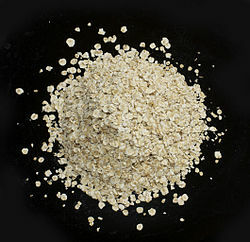 Wikimedia Commons has media related to Oatmeal.